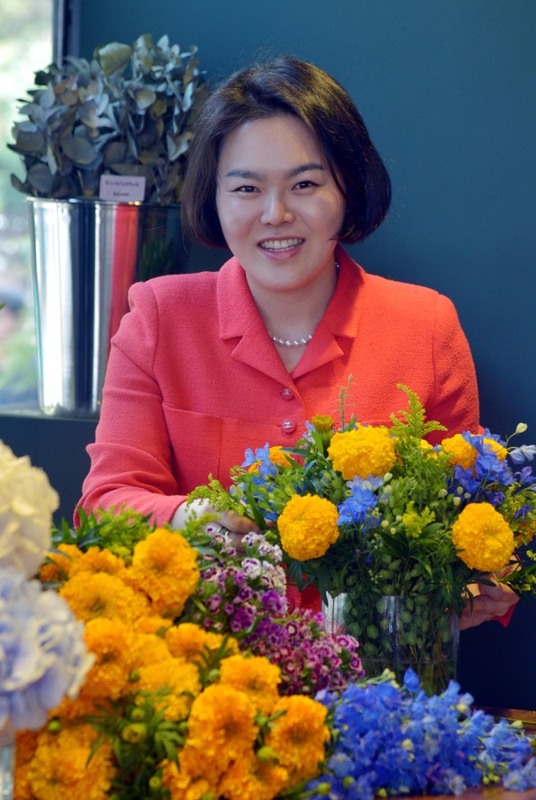 In her newly minted shop in Seoul’s Cheongdam-dong, florist Audrey Oh starts arranging marigolds, blue delphiniums, shepherd’s purse and stonecrop into a vibrant, spring-appropriate bouquet. The veteran floral designer’s swift movements make it look deceptively easy, yet the marriage of near-violet blue with ruffled golden orange, the carefully spaced exclamations of yellow-green, are portrait-worthy, serving as a testimony to her years of experience. “I like natural and simple designs,” said Oh, 31, adding she has a penchant for “glamorous” singlevariety flower arrangements. Oh then rattled off a list of her favorite hues, which range from blues to reds to hot pinks. Why does she turn to such punchy colors? “It needs to be stimulating for it to be therapeutic,” she answered. For Oh, the art of flower design is not just an exercise in aesthetic aptitude. Working with vibrantly colored blooms and breathing in the sweet aromas of flowers and plants has a healing effect, she believes. Floristry caught Oh’s attention a long time ago, when she, fresh out of high school, traveled to London to watch the Wimbledon tennis tournament. “I saw the beautiful flowers,” she said, revealing the moment that compelled her to return to England and enroll in college to study flower design. After flower design, Oh studied garden design in graduate school. While attending classes in the U.K., she also began to build a career in floristry. Oh went on to relate how she nabbed a job at the prominent British florist McQueens, where she worked her way up to the position of senior designer. She recounted her days as a onetime senior designer at McQueens, a famed florist known for its designs for high-profile events and hotels. “Competition amongst florists is fierce,” Oh revealed, explaining that nabbing a major client like a five star hotel can result in some damaged egos among the competition. She recollected her more than decadelong love affair with the world of floristry, where the creme de la creme arrange flowers for stars’ homes and muchpublicized parties, detailing how the day-to-day drama of A-list events sometimes meant dealing with unexpected surprises like a broken vase or last-minute changes. For the most part, though, Oh said it was smooth sailing, and while she enjoyed the collaborative work of creating beautiful floral art for such impressive clientele, in the back of her mind she harbored plans to return to South Korea and open her own place. This April, she finally launched her namesake shop, Audrey Flowers, putting down roots on home turf. “I had tried everything I wanted to do,” she said of why she felt she was ready to come back home after having consulted for and worked at famous hotels, Michelin-starred restaurants and celebrity-studded events. Now Oh is ready to do her own thing, crafting floral arrangements as well as teaching both professional and hobby courses at Audrey Flowers. So what wisdom does Oh plan on passing on to her students and clients? For instance, she elaborated, calla lilies have swan-like stems that can be emphasized through styling. Other important pointers include giving fragrant blooms space to allow aromas to waft up into the air, instead of clumping them too tightly together. Oh also revealed how grouping together arrangements of singlevariety flowers or using clear glass vases to show off the roots and dirt of the plants and blooms can create a visual impact. In the end, these basic techniques and ideas can become the building blocks that florists draw from to create their own identity. Top floral designers, Oh revealed, each possess their own style, one that is impervious to fleeting trends or fads. “What really matters is how well you style a small amount of flowers,” she said, asserting that this was the true test of an accomplished florist.